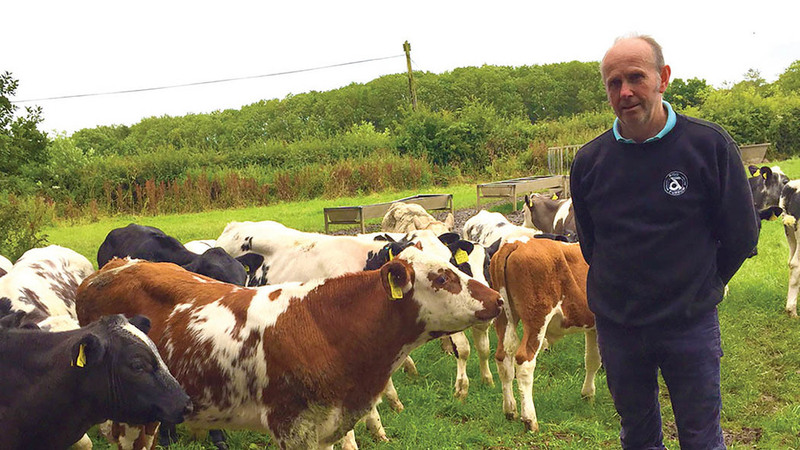 When Robert Howie made the switch from dairy to beef, he had all the wisdom gained from feeding high yielding milking cows to apply to beef production and a good understanding of the performance potential of high energy rations. Robert Howie, of Acklington Park Farm, Alnwick, Northumberland, made the decision to close down his dairy in 2009. Embarking on beef production instead, he knew he wanted to feed plenty of grain through the beef enterprise he would set up in its place and he knew he could mitigate digestive problems by feeding yeast. And with 142 hectares (350 acres) of arable and 49ha (120 acres) of pasture, it was also important to maximise the use of home-grown grain and make good use of grazed grass. Mr Howie appears to have arrived at the perfect formula for the enterprise he has established, buying-in castrated beef cross bull calves, rearing them either inside or on grazed grass as the season allows, and always offering grower or finisher rations which include grass silage, rolled barley and a 24 per cent protein blend containing the live yeast product, Levucell. “We buy the calves in batches of 50 through one reliable source,” explains Mr Howie. “They are all dairy crosses supplied by David Tomlinson, of Tomlinson Calves, Cheshire; they arrive on-farm at three to three-and-a-half months and are guaranteed to weigh at least 120kg. “We pay a small premium for better quality calves which have all been dehorned and vaccinated against pneumonia,” he says. This means the farm rarely experiences any respiratory health issues or losses and can achieve good growth rates by feeding well from the outset. “We try to keep them on a similar ration to the one they were previously fed to help minimise the stress of moving and limit any potential growth checks. We put them on ad lib coarse mix plus some straw in a ring feeder for a couple of weeks and we make sure they have Levucell in their feed from day one,” he says. Only feeding the coarse mix for a couple of weeks, Mr Howie then gradually moves the calves on to a total mixed ration. “After four weeks they’re fully on the TMR,” says Mr Howie, describing the grower ration which comprises grass silage, chopped straw, rolled barley, molasses and the 24 per cent protein blend containing Levucell from ForFarmers. “They seem to adapt very well to this ration and again, I’m convinced that’s helped by continuing to include Levucell. “It’s hard to quantify but once you start using it it’s very hard to stop because you can see they are doing so well on it,” he says. Once the youngstock are on the full TMR, the concentrate proportion is gradually increased, initially up to 3kg/head/day of an 18 per cent protein mix and by the time they’ve reached about 12 months, they are eating about 4-4.5kg of concentrates/ head/day. At about 15 months the cattle move on to the finishing ration, although the precise time again is dependent on size and weight. “They may weigh about 500- 520kg at this stage, although this will vary according to breed, as about 75-80 per cent are British Blue cross with the remainder crossbred Angus,” says Mr Howie. Again, there is a gradual transition to the full finishing ration, but importantly, Levucell is maintained as the transition takes place. “If they have grown a decent frame we are ready to push them with a bit more starch,” he says. Silage is also fed to appetite – adjusted as needed – and chopped straw continues to be included in the TMR. “The overall effect of the extra barley is to increase energy and reduce protein in the finisher ration and push the cattle more quickly through the system,” says Mr Howie. “We also increase the live yeast at this stage as the rumen is more susceptible to acidosis on this higher barley, higher energy diet,” he says. However, he adds: “The cattle show no signs of acidosis and probably have fewer foot problems as a result. By the time they are ready for slaughter, the cattle weigh between 630kg and 700kg and are aged 19 months on average, depending on breed. The final analysis comes in the gradings and the buyer, Linden Foods, Burradon, near Newcastle, reports back with 90-95 per cent of the cattle grading R (fat 3 or 4L) and the remaining 5-10 per cent at U- or O+. There is also the further benefit of selling Angus at a premium under a named sire scheme, through which it is destined for retail as branded Angus beef. Getting calves off to a good early start means focusing on rumen development and setting the animal up for long-term feed efficiency. That is why the live yeast product, Levucell, is introduced at an early age on many farms as it not only promotes the formation of rumen papillae but it also helps the young animal maximise its potential to use feed efficiently. And with a well-developed, healthy rumen, these feed efficiencies – which are never better than in the calf – can continue to persist throughout the animal’s life. “There will be many continuing challenges to good rumen function at each stage of the animal’s life,” says Nick Berni, ruminant product manager at ForFarmers. “This depends largely on the animal’s diet but a classic example is when there’s a heavy reliance on rolled cereals, causing starch levels to rise. “High starch diets are a risk factor for ruminal acidosis. Even if this disorder only occurs at a sub-clinical level it will still impact performance, and if it becomes severe, it will cause damage to the lining of the rumen. “Levucell will continue to help in exactly this situation,” he says. “It will do so by regulating rumen pH, improving fibre digestion and scavenging oxygen. This includes the ‘mopping up’ of lactic acid by the bacteria encouraged by the yeast, which will help to maintain a constant rumen pH of 6.2 or higher. Since Levucell is encapsulated in a fatty coating which protects it in challenging conditions, it has the scope to be included in many types of the feed which could be used throughout the animal’s life, ranging from pellets to pre-mixes, for use in home-mixes or total mixed rations. “Once in the product, Levucell remains intact and alive, ready to do its work once consumed by the animal when the fatty coating will break down in the presence of rumen enzymes,” explains Mr Berni. Because of its versatility and its potential to improve digestion, Mr Berni says there is no nutritional or practical reason why live yeast cannot be used from weaning through to slaughter.